Frozen Shoulder Symptoms - Jeffrey H. Berg, M.D. Frozen shoulder symptoms vary over time. As you may recall from an earlier post, frozen shoulder (adhesive capsulitis as it is termed medically) is a problem commonly occurring in patient’s with particular characteristics and resulting in inflammation and shortening of the lining of the shoulder joint as well as inflammation in the bursa on top of the rotator cuff. How do you know when you have a frozen shoulder? The symptoms of frozen shoulder tend to follow a specific pattern (see adjacent diagram). This pattern is commonly divided into four stages. Those with frozen shoulder tend to go through these stages fairly predictably. However, how long a person’s shoulder may spend in each stage or take to get through all the stages varies from person to person. The frozen shoulder symptoms at this stage appear very much like isolated shoulder bursitis (impingement syndrome). As a result, if a person is evaluated at this early stage, it is not uncommon for the diagnosis to be mistakenly labeled impingement syndrome. The common symptoms during this stage are pain with shoulder motion but not at rest. The pain is frequently on the side of the shoulder but may be deep in the shoulder as well. There is also normal or near normal range of motion. This is the inflammatory stage. 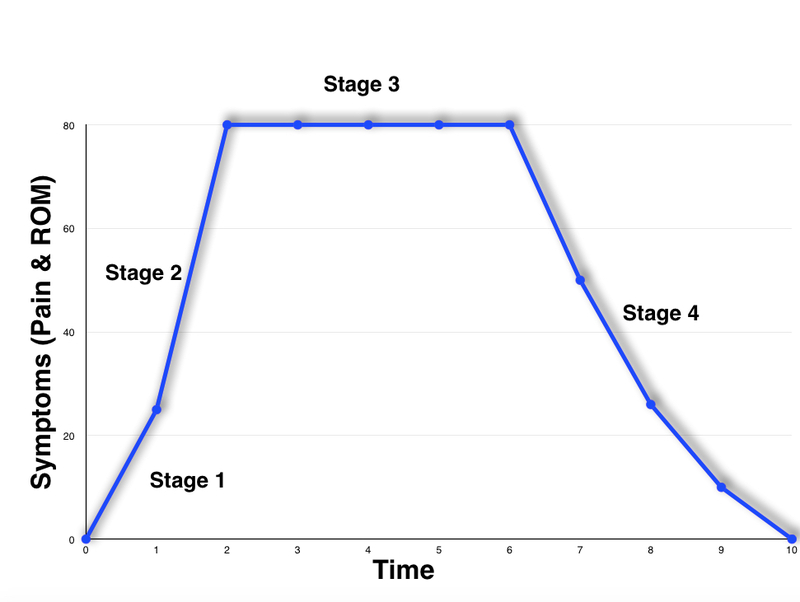 The symptoms during this stage are progressive and this stage is typically the most painful of the four. It is often marked by pain in the shoulder with and without shoulder motion as well as progressive shoulder stiffening. Since this stage can be very painful, it is often at this stage when people present to their doctor for their initial evaluation. Usually the frozen shoulder symptoms in this stage are much more tolerable. There is frequently a reduction in pain. In fact, most have very little pain unless moving their shoulder beyond its limits. Range of motion remains limited but it is stable without any further reduction during this stage. In prolonged cases of frozen shoulder, it is often at this stage that people “get stuck”. The frozen shoulder symptoms recede during this stage. The pain continues to resolve until no further pain persists. The range of motion also continues to improve until it is normal or nearly normal. With just a single evaluation, it can be difficult to tell which stage you are in. Usually only by observing how the symptoms progress over time, can the specific stages be identified. Most people, if given enough time, will progress through these stages on their own, without treatment. Some may rapidly go through these stages and some may have a protracted course that can take up to 18-24 months if untreated. Treatment can often reduce the symptoms and shorten the course. I will discuss frozen shoulder treatment in a future post, but in the meantime, if you are suffering from any of the above symptoms, it’s probably a good idea to get your shoulder evaluated.